I was inspired today while reading the book Eat Fat, Lose Fat by Dr. Mary Enig & Sally Fallon. This fascinating book takes an in-depth look at good fat (animal fat, nuts, whole dairy, anything from the coconut, etc.) and the positive effect it can have on our weight and health. Halfway through page eight the idea for a delicious new soup struck me and I immediately jumped up and rushed off to make it. Some trial and error later and I landed on the perfect combination of savory mouth-watering richness. If you love spice: add some cayenne pepper or extra chili flakes. Serve on it’s own or with some warm, crusty bread. This soup is creamy and satisfying – the perfect dish for a rainy day. I hope you enjoy it as much as I do! Melt the butter and coconut oil in a saucepan over medium heat. 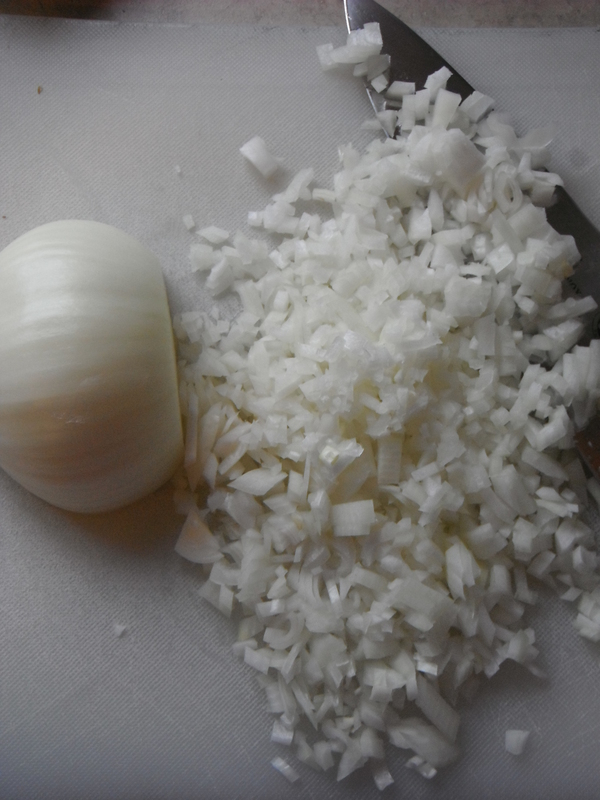 Finely dice the onion and add to the saucepan. Cook on medium heat until the onion begins to caramelize (about 8 minutes). Once the onions have caramelized slightly, add the curry powder and salt and stir to combine. Add the chicken stock and bring to a simmer. 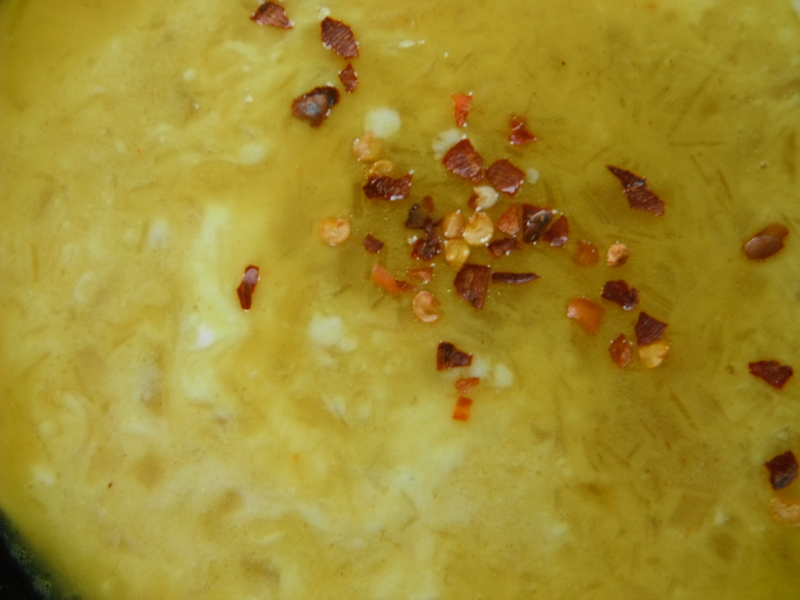 (At this point the soup can be pureed if desired – either in a blender or with an immersion blender. Take soup off the heat and ladle into bowls. Spoon some of the coconut milk into the center of each bowl and lightly swirl in with a spoon. 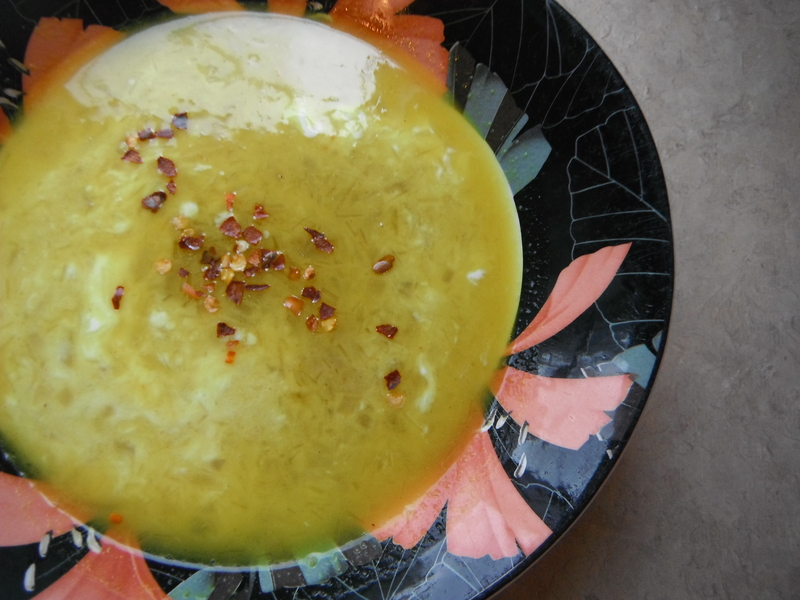 Sprinkle the red chili flakes on top of the soup and serve immediately! Makes enough for 2 large bowls or 4 appetizers. I made this combo in the crock pot last night (to put in the fridge and cook today) but poured it over chicken. Hopefully, it will taste good tonight for dinner. And, yes, I thought of you when I made it, Lorna!